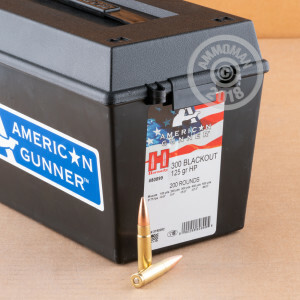 Hornady’s American Gunner line of ammunition comprises versatile and hard-working rounds that you can make good use of however you plan to shoot. 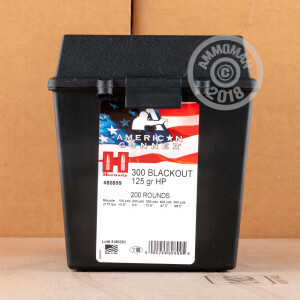 Whether you’re embarking on an endeavor as noble as shooting up your old laundry detergent bottles, or just tending to something as perfunctory as entering an elite shooting match, then you’ll be certain to find this 300 AAC Blackout cartridge squarely up to the task. This round’s clean burning propellant delivers a consistent muzzle velocity of 2,175 fps. That provides its 125 grain projectile with the oomph to get out of the gate, and its concentric jacket, uniform core, and narrow hollow point meplat see to it that it steadily makes its way to its target. This cartridge further offers the fresh brass casing which handloading enthusiasts relish, as well as a non-corrosive primer that’ll spare your action from accruing undesirable residues. These 200 cartridges are stacked in a plastic field box. Its durable handle will let you carry your ammo to the range or into the woods in style, and the tight fashion in which its lid seals will make it your go-to ammo storing solution for years to come.